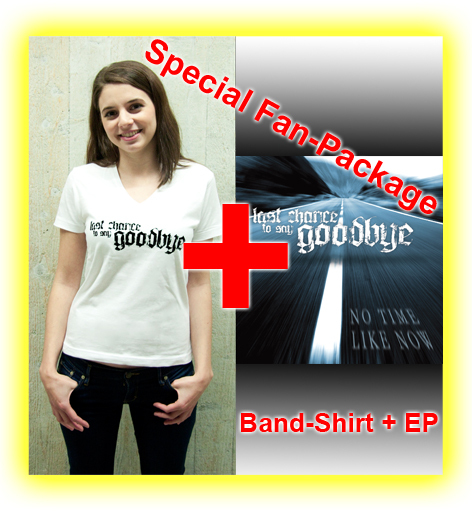 No Time Like Now EP and Last Chance to Say Goodbye Official Band Shirt for only CHF 29.90! No Time Like Now is as you might know not only the name of our debut EP but also the spirit of our live-shows. We're happy to be finally able to present six ouf our greatest songs on this first and unique disc... No Time Like Now indeed. This fancy white shirt with a noble serigraph logo print on the front is a must for every fan of Last Chance to Say Goodbye. Order this Combo-Package exclusively and shipping cost free right now.